Anthony Pessano came to Ecorse with a far-sighted dream of building a shipyard on the Detroit River across marshes where muskrat enjoyed full reign. An equally farsighted in the capitalistic sense - old Ecorse Frenchman sold him some of the marsh acres with one condition. Officially, Anthony Pessano didn’t record his answer, but the marshes continued to yield muskrat for the famous muskrat dinners that Downriver restaurants served for so many decades. It is probable that Pessano granted the Frenchman’s request and that the Frenchman and his heirs kept part of the family property bordering the Detroit River for them selves and the muskrats. Anthony Pessano’s dream of a shipyard on the marshes also came true. In the 59 years between 1902 and 1961, The Great Lakes Engineering works ship yard built most of the large freighters in the Great Lakes fleet. Altogether it turned 303- some sources estimate 338- vessels, and at times employed as many as two thousand local workers when a multi-million dollar vessel needed to be built. The Engineering Works constructed ships for the United States Government in World I and World War II and also built the cruise ships North American and South American, the state ferry Vacationland later called the Jack Dalton and eleven sections of the New York Central tunnel under the Detroit River. The Edmund Fitzgerald is probably the most famous ore carrier that the Engineering Works built but the names of many of their other vessels such as Carson J. Calloway, Ann Arbor No. 6, and Arthur B. Homer earned niches in Great Lakes maritime history. In 1961,The Great Lakes Steel Company in a move that some would call irony and others progress, bought the Great Lakes Engineering works for a sale price of $3,500,000 as part of its expansion program. In an April 30, 1961 article in its pictorial magazine, the Detroit News lamented that “It’s the End of an Era”. Detroit had ceased to be a shipbuilding center with the sale of the Great Lakes Engineering Works and there was only one major Michigan shipyard left – the Defoe Shipbuilding Company in Bay City. Ships from other companies now handled most of the ore that Antonio Pessano and the American Shipbuilding Company had founded shipping empires to build vessels to transport up and down the lakes. American steamship companies now bought parts or whole ships in cheaper yards abroad. The time honored tradition of shipbuilding along the Great Lakes was passing into history on ways figuratively greased by the very men who spent fortunes and careers building them. Part of the reasons for the demise of the shipyards was their very success- they priced themselves out of the market so to speak- and the stifling effects of the iron and steel and shipbuilding monopolies on competition and diversification. George Fink, a steel man from the East who founded Michigan Steel Corporation in Ecorse, Michigan in 1928 and expanded it to Great Lakes Steel in 1929, had a great deal in common with Antonio Pessano who founded Great Lakes Engineering Works, the company that Great Lakes Steel later would buy. For both men, the bottom line was controlling the production of iron and steel. Like George Fink, Antonio C. Pessano was born in the East. The son of Antonio D. and Elizabeth Pessano, he greeted the world in Philadelphia on July 3, 1857. His parents provided Antonio with a broad education at Philadelphia High School, Franklin Institute of Technology and later with private tutors in mechanical drawing, chemistry, and mathematics. Shortly after his 33rd birthday in 1880, Antonio married Elizabeth A. Walker in Philadelphia on September 22 and was well on the way to establishing his business career. The owners of the 500 companies of the National Foundry Association depended on Pessano to keep the iron and steelworkers happy and productive. On several occasions Pessano’s grasp of the issues, his common sense and firmness helped prevent serious labor troubles. By 1902, Pessano had learned mechanical drawing, technical engineering, and mathematics. He had mastered building engines, ships, and took out a score of patents for his improvements in power transmission. In 1901-1902 he moved to Michigan to take over the former Samuel F. Hodge & Company. Samuel F. Hodge, founder of Samuel F. Hodge & Company, marine engine works, immigrated to America in 1849 from Cornwall, England after working as a blacksmith for several years. After a brief stay in Toledo, he came to Detroit to work on the construction of the fortifications at Fort Wayne. After Fort Wayne was completed he worked in a blacksmith shop at De Graff & Kendrick’s Iron Works, at a locomotive works and sold mining machinery for Lake Superior mines. In 1863 with some partners, he organized a firm of his own to manufacture engines and machinery. Hodge served as president of his company until his death in April 1884 when his son Harry S. Hodge assumed the presidency. The company was located at the corner of Atwater and Rivard Streets in Detroit and boasted several progressive innovations for its time. The main buildings included a foundry and blacksmith shop, a machine shop and equipment included an electric crane, and a surface railroad. A library containing texts books, statistics and reports, drawings and blueprints pertaining to the marine engineering trade was located in the private office of the president. In the approximately thirty years the company had been in business it produced over 125 marine engines nearly all of which were in service on the lakes, as well as repair work and stationary engines. The company made the first triple expansion engine on the lakes for the Roumania and installed it in October 1886 as well as the engine for the Colgate Hoyt, the first of Captain Alexander McDougall’s whaleback steamers built at West Superior. The company built other whaleback engines, including the one in the steamer Wetmore that crossed the Atlantic to Liverpool and the engine for the excursion steamer Christopher Columbus of Chicago World’s Fair fame. Antonio Pessano won the confidence of such iron, steel, and shipping tycoons as George H. Russel, Colonel F.J. Hecker, W.G. 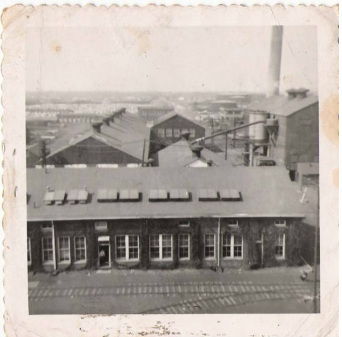 Mather, and Joseph Boyer and they purchased the old Hodge plant, which Pessano helped to capitalize at $1,500,000. In the three years from 1902-1905 , Pessano turned the old Hodge plant into the largest steel shipbuilding plant on the Great Lakes and expanded into River Rouge-Ecorse. A Detroit Free Press article in June 1903 described the new shipbuilding plant, scheduled to be completed for the most part before August 1. Located in Ecorse-River Rouge, the plant covered an 85-acre tract with 1,400 feet frontage on the Detroit River, and was built around the nucleus of the old Hall BrickYard. The Michigan Central and Detroit Southern railroads had trackage into the yard. There were four shipbuilding berths, 600 feet long, so that four of the largest vessels ever planned for the Great Lakes could be built at the same time. Two slips for the side launching of ships were located between the berths. One of the slips was 600 feet long by 125 feet wide and 14 feet deep and the other measured 600 feet long by 150 feet wide and 30 feet deep. An electric traveling crane ran beside each building berth to carry the components of the ship from the shops to the ship. There were also two ten-ton steam locomotive cranes that ran on tracks to all parts of the yard to lift, haul and carry supplies and material. Eventually the Engineering Works added a floating dry dock, the largest on the Great Lakes, and a subsidiary plant in Ashtabula, Ohio. "A man isn’t much good as the head of a ship company unless he can go out and get orders. I learned that the company had been contracting for tonnage. I showed the managers that they could make more by owning than by leasing. After that it was a simple matter to close the contract for $750,000. Depend on it, there is no money lost in the shipping business these days. In the tradition of creating his own shipbuilding monopoly and perpetuating the paternalistic company, Andrew Carnegie style, Pessano provided houses for the ship employees around the River Rouge-Ecorse division of Great Lakes Engineering Works. Don’t they look bright? I always recommended that our company paint the houses in cheerful colors. To my mind, nothing is more depressing than to see row after row of lead-colored houses. There are too many like that in Detroit. The district near our works is dotted with cottages painted in warm blues, rich yellows, soft greens. It rests the mind and leases the eyes. It is a relief from the many ugly colors common in Detroit. You may not think so, but the color of the house in which a man lives has a little influence in the upbuilding of the city. I am proud of the bright-colored village down at the Rouge. In 1905, Beeson’s Marine Directory of the Northwestern Lakes reported that Great Lakes Engineering Works was busy building eight large lake freighters, six of them at Detroit and two at St. Clair, Michigan. They were also building a drill scow equipped with special machinery for the Dunbar & Sullivan Co. of Buffalo, New York. And for their own use they are building a large steel floating dry dock,600 feet long by 105 in width and 30 inch depth with a capacity of 4,000 tons, gross weight. The Great Lakes Engineering Works also did custom refitting makeovers on already existing boats. In June 1906, Mont. Tennes and his backers paid the Great Lakes Engineering Works $20,000 for the steamer John R. Stirling that they planned to use as a floating pool room to compete with the City of Traverse. The Stirling was formerly the freight steamer Vanderbilt that had traded in the package freight business between Chicago and Buffalo. Tennes and his backers estimated that they would have to pay out another ten thousand dollars before the Stirling was ready for service. They planned to add a cabin on the upper deck and make other changes so that the ship could accommodate 1,500 people. The owners had secured a landing place for the Stirling in the Chicago River east of the Rush Street bridge and Captain George Tebo, lately in the vessel fueling business on the Chicago River, was to be master of the J.R. Stirling. The 356-foot R.W. England was the first ship that Great Lakes Engineering Works launched in 1904. Later the England became the Frank Seither and still later the Fontana. The Fontana stayed in service until 1960 when she was sold to Marine Salvage of Port Colborne and scrapped at Hamilton, Ontario. Great Lakes Engineering Works launched its the last ship on November 7, 1959 when the Arthur B. Homer, at 730-feet the largest ship on the Great Lakes, rumbled sideways down the ways while an estimated 10,000 spectators cheered. The Arthur B. Homer was the heaviest ship side-launched since the ill-fated Great Eastern, a 693-foot iron vessel was launched in the Thames River at London, England on January 31, 1858 and was the largest ship permissible under Corps of Engineers regulations for the Soo Locks and St. Lawrence Seaway. The Homer cost more than $7 million dollars and was the last of a three year-three freighter construction project at Great Lakes Engineering. The Homer’s sister ships were the 729-foot Edmund Fitzgerald, launched on July 7, 1958 and the other the 689-foot Herbert C. Jackson which was completed on February 19, 1959. The Great Lakes Engineering works developed the system of prefabrication and final assembly that enabled shipwrights to build the three vessels in three years. 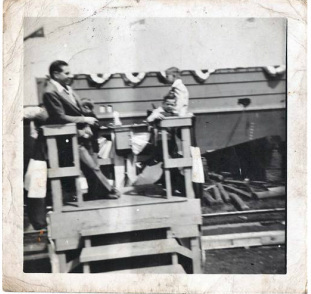 Vice- President of Great Lakes Engineering Works, George H. Russel, escorted the car ferry’s sponsor, Miss Elizabeth Walker Pessano, the daughter of Antonio C. Pessano, president and general manager of Great Lakes Engineering to the launching stand. Accompanying her were Miss Helen Pessano, Miss Helen Russel, Miss Catherine Russel, Miss Florence Russel, Miss Grace Pessano, Miss Alexandrine Sibley, Miss Dorothea Sibley, Miss Fredericka Sibley, Miss Mildred Plum and Miss Catherine Moore. On the launching stand were A. C. Pessano and George H. Russel, representing the builders; Capt. F.D. Harriman, Joseph Boyer, H.C. Potter, Robert E. Plum, Walter S. Russel, Senator Alger, William Livingston, president of the Lake Carrier’s association; J.C. Hutchins; Captain J.R. Innes of the Michigan Central Car Ferry System; Captain Harry Innes and J.A. Westley, chief engineer of the Michigan Central Car Ferry Fleet. Miss Elizabeth Pessano broke the bottle of sparkling champagne against the bow of the ferry and said, “I christen thee Detroit.” The big ship plunged into the water and another Great Lakes Engineering ship joined the Great Lakes fleet. The Jacob T. Kopp, launched on December 7, 1907, was named for a prominent banker and businessman of York, Pennsylvania and constructed to the specifications of the Pennsylvania Steamship Company. Its double water bottom foreshadowed the idea of the “unsinkable” Titanic, just five years in the future. The Kopp was a bulk freight carrier, 500 feet long over all, 480 feet length of keel, 54 feet beam and 30 feet deep. She was built on the improved arch construction principles, having double water bottom and vertical side tanks that extended upward from the water bottom. This permitted a large amount of ballast water when the steamer ran light and provided a decided advantage in case of storms. One week from her launch, the steamer’s engines and boilers and all auxiliary machine had been completely installed and the boilers were under steam. This was a record pace for the time. During World War I, the United States Shipping Board ordered at least 60 cargo ships from Great Lakes Engineering Works to transport ore from Lake Superior to the voracious Midwestern blast furnaces that produced steel needed for the war effort. The cargo ships also transported grain and other products between the lakes and some were sold to other countries to become part of their merchant marine fleets. The Crawl Keys, built in Ecorse in 29 days in 1918, was a cargo ship that traveled the lakes. Bert Belky, a shipbuilder for fifty years, lived in River Rouge. He worked as a riveter and when he was 65he retired and went to work for Fleetwood, a local company. During World War I, Belky was the world champion riveter. In those days welding was used and there was a drive on to see who could rivet the fastest all over the world. Belky won by driving 1,675 rivets a day. From the Rouge-Ecorse Great Lakes Engineering shipyard, he traveled all over the country building ships and he even helped build the Detroit-Windsor tunnel. Belky kept copies of “The Great Lakes Record”, a small magazine published by and for the employees of the Great Lakes Engineering Works. The February 1920 issue recorded these events as happening at the yard. In World War II, the government commissioned the Great Lakes Engineering Works to build an entire fleet of ore carriers – the largest in the world at the time- to rush ore from the Lake Superior ranges to the lower lakes steel mills to meet wartime steel needs. The shipyard built at least ten ore carriers and three lakers to help in the war effort. Many of the cargo ships that Great Lakes Engineering had built before and after World War I turned up in World War II merchant marine fleets. The Lake Ellithorpe was sold to Britain and eventually torpedoed, as was the Craycroft under her new name, Fred W. Green. When the Fitzgerald was launched on June 7, 1958 at the River Rouge Yard of the Great Lakes Engineering works everyone thought that the launching would make a big splash. From its very beginnings, The Fitzgerald seemed to generate superlatives. The construction of the Fitzgerald created 1,000 jobs at the Great Lakes Engineering Works. The Northwestern Mutual Life Insurance Company of Milwaukee, Wisconsin paid eight million dollars to buy the privilege of calling the naming the Fitzgerald after its chairman. At one point, the Fitzgerald was called the Queen of the Lakes because of her size. and because of her size- 8,500 tons – the shipbuilders thought that the Fitzgerald would throw a wave that would flood part of the Great Lakes Engineering Works and soak many of the thousands of spectators who had come to watch the launching. Instead, the Fitzgerald slid naturally into the water with only a nominal displacement of water. Mrs. Edmund Fitzgerald, wife of the chairman of Northwestern Mutual Life, cracked the traditional bottle of champagne over the bow. A family from River Rouge, Mayor and Mrs. John F. McEwan vividly recalled the launching of the Fitzgerald as a very special day for them. Several days before the launching their three-year-old son John had been hit by a speeding truck and had to spend several days in the hospital. He was discharged from the hospital just as the Fitzgerald was due to begin its career. Mayor and Mrs. McEwan wanted to do something for John to celebrate his homecoming so the entire family went down to the foot of Great Lakes Avenue and watched the Fitzgerald being launched. As the Edmund Fitzgerald slid into the Detroit River at 12:40 p.m. on June 7, 1958, whistles blew loudly from yachts, sailboats, outboard boats, fishing boats, scows, tugs and freighters lining the waterfront to salute the launching. Airliners, military planes and two helicopters hovered overhead. When the launching was completed, the tug Maryland moved full speed ahead to keep the Fitzgerald from swinging against the banks of the launching basin. The Maryland quickly snubbed the Fitzgerald to shore where she remained until August when her cabins would be completed and her smokestack installed. Her service years proved that the Great Lakes Engineering Company had built the Fitzgerald well. The only major work ever done on her was the installation of a bow thruster in 1969 and converting her to oil fuel and fitting automated boiler controls during the winter of 1971-1972. The Fitzgerald set a number of cargo records over the years and was a favorite of ship watches because of her attractive appearance and the antics of her longtime master, Captain Peter Pulcer, who consistently entertained anyone he thought was watching the him and his ship. 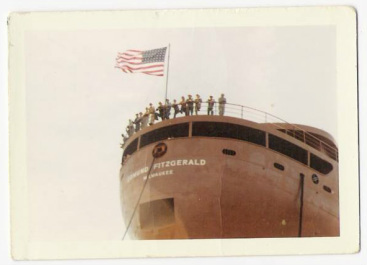 On November 6, 1975, the Fitzgerald passed the Ecorse and River Rouge shores headed toward Minnesota. She left Silver Bay, Minnesota about 1:30 p.m. Sunday carrying a cargo of 30,000 tons of taconite She cleared Superior, Wisconsin on November 9, 1975, bound for Great Lakes Steel Corporation in Ecorse, just a few yards away from where she had been launched. On the night of November 10, approximately 17 miles from the entrance to Whitefish Bay, she encountered heavy Lake Superior weather and sank with all 29 of her crew, including Captain Ernest McSorley of Toledo, Ohio, who had commanded her since 1972. Later, the broken hull of the Fitzgerald was located in 530 feet of water, the bow and stern sections lying close together. The literal and figurative bells rang in Ecorse and River Rouge as well. Many of the 303 or 338 vessels, depending on sources and how you tabulate total shipbuilding from the Detroit and Ashtabula works, that the Great Lakes Engineering Works had built did not cease plying the Great Lakes when Great Lakes Steel bought the company in 1961. The Detroit News mourned the end of a shipbuilding era, but the era continued in a different form. The story of the Sparkman D. Foster, formerly known as the Hoover & Mason, is illustrative. Two years after Great Lakes Engineering closed its shop doors, the steamer Sparkman D. Foster was towed from her winter berth in Detroit at the foot of Mt. Elliot. The Browning Line owned the Sparkman D. Foster and sold the steamer to Marine Salvage Ltd. of Port Colborne, Ontario, broker and scrap dealer. The sale of the Foster was subject to Maritime Commission approval because the transfer was to a foreign flag. Before she was scrapped the 524 feet long and 9,800 ton capacity Foster contributed and received parts of other ships. Her hull and engine were original Ecorse products and her conveyor boom and A-frame were removed and installed in the barge Marquis Roan that was seen frequently in Detroit. In 1956 the pilothouse of the scrapped freighter B.F. Jones was installed on the Foster. The Foster also contributed to Great Lakes history for over fifty years. She came out in the Tomlinson fleet with the unusual double name of Hoover & Mason. For 23 years she was a bulk ore and grain carrier, but in 1928 she was sold to Boland & Cornelius, converted to a self-unloader and renamed E.M. Young. The following year she was renamed Col. E.M. Young. Browning Lines bought her in 1953, reconverted her to a straight-deck bulk carrier and brought her out again in 1954 as the Foster- named for Detroit’s best-known admiralty lawyer. The Foster’s life history paralleled that of many Great Lakes Engineering vessels and illustrated the longevity and durability of their product. The saga of the last ship that the Great Lakes Engineering Works built, the Arthur B. Homer, also attested to the durability of Great Lakes Engineering construction. The Homer slid down the ways of the Great Lakes Engineering Works in Ecorse on November 7, 1959. At the time of its launching the carrier was the biggest ship on the Great Lakes and its launching the largest side launching in maritime history. The Homer was the largest ship ever to be launched sideways and outmeasured the Edmund Fitzgerald, then the Queen of the Lakes, by one foot. The ship started to move and whistles blared from long idle ore steamer quartered in the Great Lakes yard and from freighters that had anchored in the Detroit River to watch the launching. Several tugs and smaller boats hovered around the Arthur B. Homer. The Homer’s reign as the largest ship on the Great Lakes proved to be brief. In 1960, another 730-footer, the Edward Ryerson was launched in Manitowoc, Wisconsin. Paradoxically, more than a decade later, another Wisconsin shipyard, Fraser Shipyards, Inc. of Superior, Wisconsin, lengthened the Homer. The Homer entered the shipyards in late September 1975 and in October 1975, Fraser drew up plans to expand her. First a new midbody was fabricated, then on October 26, after the Homer had been cut in two near midships, the work began. The stern half of the ore freighter was floated out of the dry dock and the new midbody floated in. The forward half of the ship was firmly ballasted on the keel blocks in the floor of the dry dock. Once the 75-foot wide and 39-footdeep midbody was positioned, the stern was winched back into the dry dock and aligned properly with the new midbody. Then the dock was pumped dry and the stern and midbody sections lowered into a position level with the bow. In the next few weeks, the workers welded the midbody to the bow, and later the stern to the midbody. Special steel straps were welded the full length of the ship’s bottom and to the spar deck outboard of the hatches to provide added longitudinal strength. The installation of the 960-foot midbody section in the 730-foot Homer, made it the largest American Flag vessel ever to be lengthened and workers finished the job in a little more than two months. Fraser also increased the Homer’s cargo capacity from 27,000 gross tons of iron ore to 31,200 and installed a bow thruster to improve her maneuverability. For three decades, the Homer carried iron ore from upper lake ports to Taconite Harbor, Minnesota to Bethlehem’s Burns Harbor plant on the southern shore of Lake Michigan and to the company’s Lackawanna, New York plant on Lake Erie. She labored until the early 1980s when she laid up in Erie, Pennsylvania. In December 1986 her owner towed her to Port Colborne for dismantling. This last ship that Great Lakes Engineering built symbolized Antonio Pessano’s vision of iron and steel and ships transporting the ore to make that iron and steel. Antonio Pessano was a nineteenth century industrial baron building his shipping company on Andrew Carnegie’s idea of controlling the sources of supply, thus controlling its manufacture and pricing. Pessano also advocated pride in workmanship and in his workers. The story of the Great Lakes Engineering vessels can be used as a metaphor for the adaptability and ingenuity of America’s maritime tradition and a practical application of the qualities that Great Lakes founder Antonio Pessano used to found his business. Hopefully, the 21st Century will produce an Antonio Pessano and a renewal and redirection of the Great Lakes shipbuilding industry. Name Type Dim. Feet Cap. Delivd. Name Type Gross Tons Deliv. 36 vessels were built at the Ashtabula yard of the Great Lakes Engineering Works. The figures cited in The Ecorse Advertisers of April 1961 are 303 and 338. Ecorse Advertiser. Rouge Shipyard Closing Down, March 16,m 1961. P. 2; Ecorse Advertiser, Stotckholders Approve Sale of Shipyard, p. 2. History of the Great Lakes, Volume II. (Chicago: J.H. Beers & Co., 1899; Reprinted by Freshwater Press, Inc., Cleveland,Ohio, 1972) p. 283. History of the Great Lakes, p.283. Michigan State Archives, RG 61-11,Abstracts of Reports of Corporations, Lot 3, Vol. 3 (1899-1904), p. 95. A list of the stockholders attests to the power and influence that Antonio C. Pessano enjoyed. Antonio C. Pessano; H. W. Hoyt, vice-president, Allis-Chalmers Co., Chicago; H.C. Potter, Jr., Detroit, vice-president State Savings Bank; C.L. Freer, Detroit, capitalist; H.B. Ledyard, Detroit, president Michigan Central Railroad; George H. Russel, Detroit, president State Savings Bank; H.M. Campbell, Detroit, of Russell & Campbell; W.G. Mather, Cleveland, president, Cleveland Cliffs Co.; Henry Russel, Detroit, general attorney, Michigan Central Railroad; John A. Penton, Detroit; John H. Avery, Detroit, Belle Isle & Windsor Ferry Co.; Henry Ledyard, Detroit, attorney; W.S. Russel, Detroit, vice president, Russel Wheel & Foundry Co.; J.A. Ubell, Jr., Detroit, naval architect; Henry Penton, Detroit, marine engineer; W.J. Wickes of Wickes Bros., Saginaw, Michigan; I.W. Frank, Pittsburgh, president, United Engineering & Foundry Co.; O.P. Letchworth, Buffalo, President, Pratt, Letchworth & Co.; W.D. Sargent, New York, president American Brake Shoe & Foundry Co,; J.R. Russel, Detroit, secretary and treasurer, Russel Wheel & Foundry Co., and Great Lakes Engineering Works. Antonio Pessano Shipbuilder, Detroit Free Press, November 12, 1905. Beeson’s Marine Directory of the Northwestern Lakes, 1905, p. 161. The Michigan State Gazetteer and Business Directory published by R.L. Polk and Company , dates from 1903-1932 provides a list of Great Lakes Engineering management personnel and advertisements. Beeson’s Marine Directory of the Northwestern Lakes, 1905, p. 161. For Floating Poolroom, Real Use For Steamer Stirling at Chicago, Detroit Free Press, July 1, 1906. Detroit Free Press, Lake Marine News, Launch at Ecorse Yard, November 13, 1904. Lake Marine News, Launch at Ecorse Yard, Detroit Free Press, November 13, 1904. Shipbuilding on the Great Lakes, “The Nautical Gazette,” April 2, 1908, p. 3. Bert Bekly, copy of the Great Lakes Record, February 1920 issue; The Ecorse Advertiser, May 21, 1968. The Ecorse Advertiser, September 8, 1976. Historical Collections of the Great Lakes, The records of the Great Lakes Engineering Works, Bowling Green State University, Bowling Green, Ohio.